Boise is closer than you think. 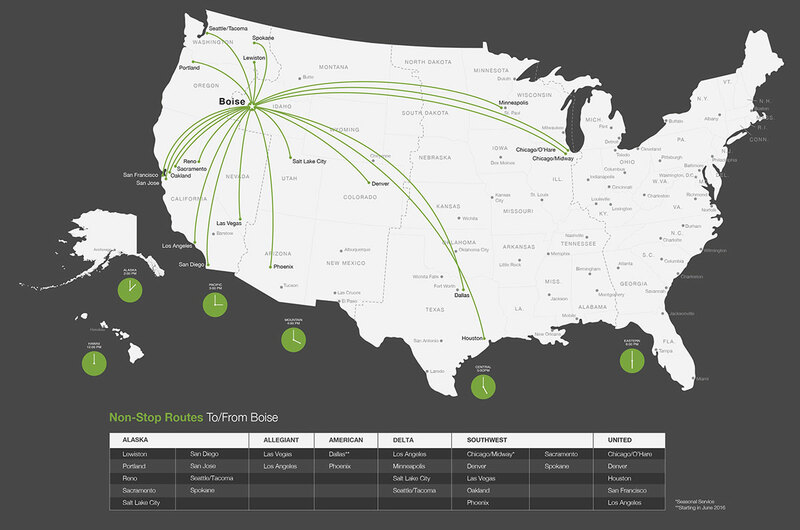 With 20 nonstop daily flights from most major U.S. cities, getting to Boise is a breeze. Airline carriers include Alaska, American, Delta, Frontier, Southwest, United, and Allegiant. The Boise Airport is less than seven minutes from downtown, and most hotels offer complimentary shuttle service. Please contact your hotel for more information. Along with the convention center expansion, in the past two years four new hotels have opened near Boise Centre to accommodate a growing number of visitors. Currently, there are nine hotel properties within walking distance of the center offering a combined 1,275 rooms. Thousands more hotel rooms are available within a short drive. From luxurious to affordable, Boise has the hotel accommodations to help you host a successful event. For a complete list of hotels in Boise visit our partners at the Boise Convention and Visitors Bureau.